ME-Mommy Etc: Mamma Chia-A Review and Giveaway! Mamma Chia-A Review and Giveaway! I AM HAVING SOME TECHNICAL DIFFICULTIES WITH THE BLOG-YOU EITHER NEED TO GO FULL WEBSITE IF YOU ARE MOBILE TO COMMENT OR EMAIL ME YOUR COMMENT AND I WILL POST IT. SORRY FOR ANY ISSUES! I was approached by the Mamma Chia company a few months ago and was asked if I wanted to try their Granola and other chia products and do a giveway on my blog. I heard the word giveaway and said yes...but I was still a little nervous I love granola and sometimes things made with Chia are.....well they can taste like I am licking a chia pet! When my granola came I was first impressed with the selection of flavors. A lot of healthier granola's don't have many options for flavors. I recieved Wild Blueberry, Vanilla Almond, and Cinnamon Pecan. I immediatly went for the Wild Blue berry. 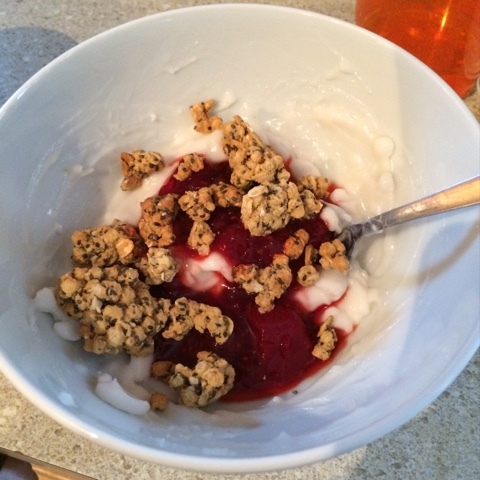 I made a lactose free yogurt and granola parfiat. It was amazing. The chunks of granola were great either to eat as a cereal or as a tasty snack. Over the next two weeks I also tried the other two flavors. The blueberry still remained my favorite but the others were also really good. Now here is the deal with the granola-It has 10 grams of protein so its stuper filling, 5 grams of fiber to keep things moving, and no soy or dairy. Also in terms of granola the calorie and fat content were not bad. In fact it was only 3 points per serving which is low for granola in terms of weight watchers. The product is also organic!!! My only critque of the product is this...if you love buttery granola the kind that is like 1000 calories per quarter cup...this is not that granola. It is a great healthier option. It is sweet without being over poweringly sweet. It has amazing crunch-even in milk. It doesn't have what I call the bark taste either. We all know super healthy cereal sometimes tastes like we are eating friggin tree bark....none of that here. Mamma Chia also has two new products Chia Squeezes which are like apple sauce pouches for adults and Mamma Chia drinks. I was give several coupons to try them but I haven't made my way to whole foods yet to try them (I will review them when I do). But I didn't want to wait any longer to get this giveaway going. 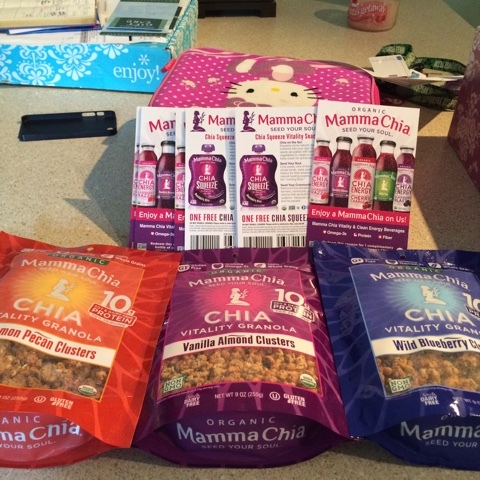 The folks over at Mamma Chia wanted to get the word out about their amazing products so they are offering a Super Chia Package for one of my readers to try!!! So if you want to be entered to win...comment below. Contest will run from July 27-August 3. Tell which product you would want to try most. Also stop by the Mamma Chia website for all their amazing products! I want to try the Wild Blueberry granola. I would love to try the Cinnamon Pecan flavor.